But before I announce the winner - i know that since so many of you expressed interest in Larissa's great designs, we are pleased to announce yet another fabulous Giveaway on the Weddzilla Blog next week. SO~~~ if you didn't win this one, you get yet another chance to win something else next week from Larissa! (Isn't she fabulous?)! Also, Larissa has graciously decided to give anybody who mentions the Relentless Bride Blog to her will get free shipping up to $25 dollars on their order of her services for invitations and stationary until December 31, 2009. Tiffany, thanks so much for entering, tweeting, following, subscribing and fanning to get several entries into the contest. You were very dilligent and it totally pays off! 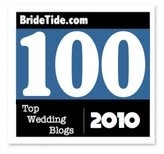 I know this giveaway win will totally personalize your fabulous wedding that is coming up! :) Be sure to contact me at amyjean@relentlessbride.com so i can put you in contact with Larissa... you are gonna have an awesome time with her. 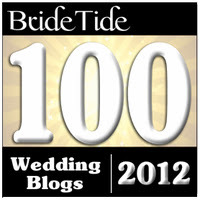 Everybody else... be sure to check out the Weddzilla blog early next week for the next giveaway from PaperCake Designs. Also, take advantage of that free shipping offer - customizing invitations with Larissa will be an awesome way to make your wedding totally YOU.